Lemon Head by Dark Horse Genetics combines two of the most lemony-tasting strains into a fabulous dream for cannabis connoisseurs. Her smoke brings out the nice and sweet citrus taste with only few tangy notes, making for a very enjoyable and mouth-watering smoke that will make you want more! For making Lemon Head, Dark Horse crossed a Lemonade female with a Lemon male which resulted in a strain that shines with a super-intensive lemon flavour. Out comes a true dream for any cannabis connoisseurs who love their smokes mouth-watering fruity and sweet. A plus is that Lemon Head keeps the sour notes less prominent and brings out more of the sweeter citrus fruit notes which makes for a particular pleasant smoke experience. When you grow the females of this regular strain after germination, you shouldn’t expect any hassles. Lemon Head does well whether you grow her indoors or outdoors. 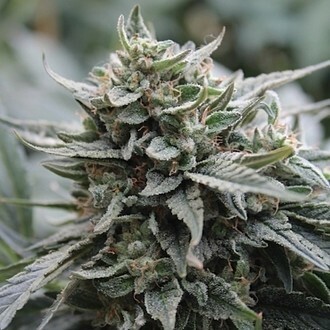 With a flowering time of only 8-9 weeks she keeps things reasonably short until harvest time and doesn’t demand too much patience of the grower either. When she grows, her buds will exude an intensive lemon citrus flavour that will prepare you for her great aroma and taste when you finally smoke her. Lemon Head by Dark Horse is an all-around great Indica/Sativa hybrid that will absolutely satisfy. Her sweet and fruity aroma makes her a top choice for cannabis lovers who won't be disappointed!